Uberkate is known for their utterly gorgeous personalised jewellery, and now they’re giving it even more meaning. 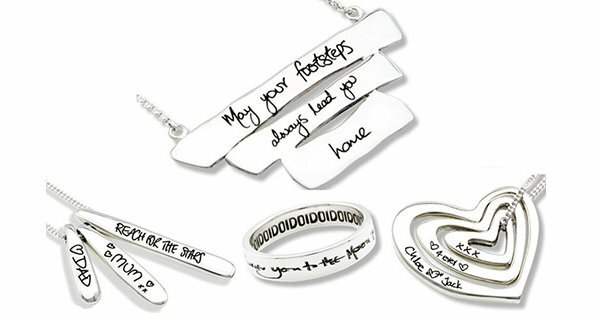 Uberkate can add your loved one’s handwriting to any piece of jewellery from their exquisite collection with their all new Your Script service, ensuring a personalised keepsake that’s as unique and personal as can be. I lost my dad three years ago very suddenly to cancer and I still think about him every day. I wrote a very personal post about him on Babyology the week he died as I was still very much grieving. When I recently spoke to the lovely Kate Sutton about her new personalised jewellery at Uberkate, I had tears in my eyes thinking about how I could create a piece of jewellery with some of my dad’s stunning calligraphy writing so he could be with me every day (see image above). I took some special words from my birthday cards when I was ten and eleven and Uberkate used this writing to put onto a silver bracelet. I am amazed with the new Your Script service. Turning up the notch on keepsake jewellery and combining technology with sentiment, they’re able to engrave your loved one’s handwriting onto any of their gold or silver pieces, enabling a gorgeous new bracelet, necklace or cuff to become a precious family heirloom. 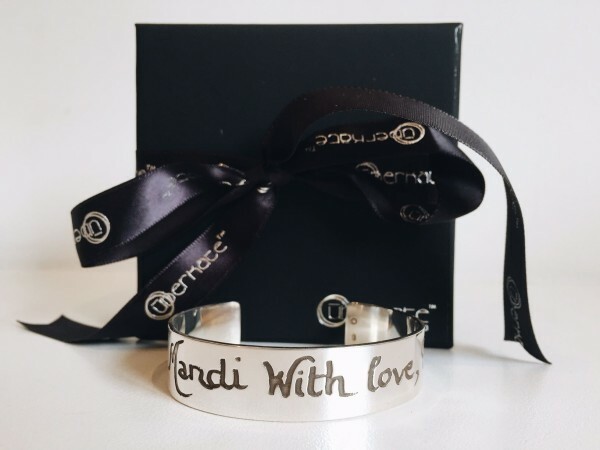 What people choose to have engraved will vary greatly, perhaps your first handwritten Mother’s Day message from your child, a verse of a love letter from your spouse, a beautifully written wedding vow or even sentiments from a card given by a parent or grandparent who has sadly passed. Uberkate is able to scan the handwriting (or even drawings) to create an exact replica to have engraved on a piece of Uberkate jewellery, capturing a special moment in time forever. The Your Script service costs an extra $75 in addition to your Uberkate jewellery purchase. Creating your unique piece is easy. Simply choose your jewellery piece, select your precious metal, upload your handwritten script (Uberkate give easy to follow instructions to guide you) and they’ll set about working their magic to create a stunning personalised piece just for you. Uberkate jewellery can take up to three weeks to create, so order soon if you’re planning on giving a special piece to someone – or to yourself – for Christmas.